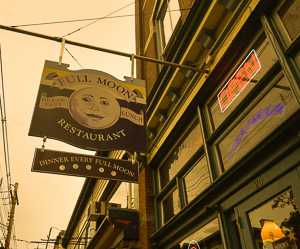 Once a month — or, if you are lucky, twice, when there’s a blue moon — Full Moon Cafe in Lambertville, New Jersey, celebrates by serving dinner, and you can reserve a table so you won’t miss it. The popular breakfast/lunch/brunch restaurant wraps you in its blue and flamingo pink lighting where happy diners sample the hearty creativity of a generous dinner where the theme draws inspiration from the special name of that month’s moon. Mirrors, art, and moon lights complete the ambience. Casual wear and BYOB are the norm in this reasonably priced restaurant. While it is a little noisy for that special date, the tables are small enough to lean in and not be uncomfortable for a more intimate conversation. The early crowd often consists of baby boomers, who yield to millennials after 7 p.m. I savored the experience during a Hunter’s Moon in October, and the harvest-themed menu more than made up for a cloudy evening that unfortunately obscured the lunar guest of honor. The current moon’s menu is posted on Facebook shortly before the event (https://www.facebook.com/thefullmooncafe/), and you can review the history of menus to plan ahead. Seeking to sample a variety, I opened with the hearty, tasty grilled Cajun Shrimp and Andouille appetizer, followed by Salmon with Raspberry Mint Sauce, both of which expressed more subtlety than I expected in the brisk, but not rushed, service of this cafe. Choosing two sides proved challenging from the many offerings, but I settled on Lentils with Feta and Red Pepper along with the Pumpkin, Sage, Zucchini, and Cauliflower Saute to evoke that Thanksgiving feeling a little early. Yum. Following the Octoberfest Cake with Pumpkin Filling, I was glad I had more than a month to make room for Thanksgiving after this tour of flavors. This chef knows how to season and spice. You can also enjoy breakfast or lunch here any day but Tuesday. Hours are posted on the website, http://www.cafefullmoon.com. 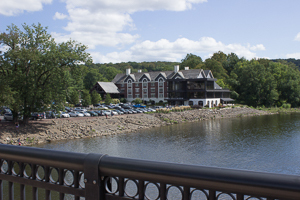 Lambertville, one of the picturesque river towns that hug the edge of New Jersey on the Delaware River just as it melts into the lush hills of Pennsylvania, makes a lovely setting for a moonlight stroll along the river or an extended stay in one of its historic hotels or a B&B. There’s plenty of artful window shopping available, and for me, this unseasonably warm evening included a leisurely walk across the small toll bridge to the town’s more Bohemian sister, New Hope, PA — also the home of many restaurants and the Bucks County Playhouse. Lambertville’s main streets and lots offer metered parking (9-9, Monday through Saturday; 1-9, Sunday), and you can pay with coins or the Parkmobile app (http://www.lambertvillenj.org/about-lambertville/parkmobile). You may park free on residential streets if you can find a space. En route, I would avoid the highways and take the county roads for a beautiful reminder of the farms and landscape that earned New Jersey the nickname The Garden State.